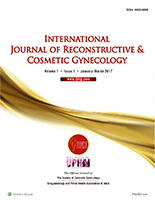 International Journal of Reconstructive and Cosmetic Gynecology, a publication of The Society of Cosmetic Gynecology, is a peer-reviewed print + online, Semiannual journal. The journal's full text is available online at http://www.ijrcg.com. The journal allows free access (Open Access) to its contents and permits authors to self-archive final accepted version of the articles on any OAI-compliant institutional / subject-based repository. The journal will cover technical and clinical studies related to health, ethical and social issues in field of Cosmetic Gynecology, Plastic Surgery, Female Cosmetic Genital Surgery, Reconstructive Gynecology, Female Pelvic Surgery. Articles with clinical interest and implications will be given preference. International Journal of Reconstructive and Cosmetic Gynecology, a publication of The Society of Cosmetic Gynecology, is a peer-reviewed print + online Semiannual journal.